The American Gold Buffalo is a young bullion gold coin that was offered for sale in 2006. Their production was authorized a year prior to that by the Presidential $1 Coin Act. The American Buffalo Gold coin is the first 24K gold coin minted by the United States Mint. The American Buffalo Gold bullion coin has been produced with the purpose of offering investors a simple and tangible way to own and trade exactly one troy ounce of 24K gold. The American Gold Buffalo is legal tender in United States, having a face value of $50. The American Gold Buffalo was United States` manner of competing with other mints from all over the world that were producing bullion gold coins of 99.99% fineness, like the Canadian Maple Leaf and the Chinese Gold Panda. Investors seldom prefer trading bullion gold coins that have 24K gold in their composition and the American Buffalo Gold was the solution offered to investors who wanted to trade coins on the American market. If you are an investor that decides to diversify its portfolio or that wants to ensure the safety of his assets by investing into gold, there is nothing simpler than buying an American Buffalo Gold bullion coin which is available at brokerage houses, at banks, and at coin and precious metals dealers. The prices at which you will find the American Gold Buffalo coin depends on the gold spot price, on the market price for gold so don`t forget to check that. The coins` content and purity is guaranteed by the United States Government, each American Gold Buffalo coin being accompanied by an official Certificate of Authenticity released by the United States Mint. The United States Mint did not forget about collectors so it produces the American Buffalo Gold Proof Coins. In order to distinguish the proof version from the bullion one you should remember that the proof version of the American Gold Buffalo has the mint mark “W” on the obverse, behind the neck of the Indian. Creating proof coins involves a specialized minting process. Burnished coin blanks are manually fed into presses that contain special dies and each American Gold Buffalo coin is struck numerous times which makes the highly detailed images to give the impression that they are floating above the field. The mintage for the proof versions has been limited at 300,000 coins. Unlike the American Buffalo Gold bullion coins that have the price correlated with the gold spot price, the American Gold Buffalo proof coins sell at a fixed price. The interested collectors that want to expand their collections by adding these beautiful additions can buy them directly from the United States Mint. Although the American Gold Buffalo is kind of a new gold bullion coin on the market we cannot say the same about the design that is a modified version of the design for the Indian Head nickel which was issued way back in 1913. The Indian Head nickel design was chosen because it was regarded as the best design that appeared on an American coin. 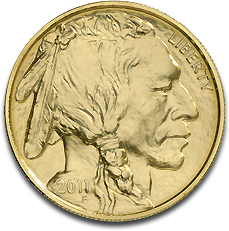 The obverse of the American Buffalo Gold bullion coin shows the figure of a Native American who is said to have been created as a mixture of the features of three Native Americans chiefs: Big Tree, Iron Tail, and Two Moons. The reverse, as suggested by the name of the coin as American Buffalo Gold, depicts an American Bison also known as buffalo. The difference between the two coins from different periods of time but sharing the same design is that the American Gold Buffalo coin has on the reverse the American motto IN GOD WE TRUST and also the inscription $50 1 OZ. .9999 FINE GOLD.